Great price and I don't have a Remington. I have the RP9 and have found that it is one of my favorite pistols. Let's see if the RP45 lives up to it's smaller brother. Already have an RP9 and it shoots great. This will be my secondary gun for duty use with the Arizona Rangers. If it is half as good as the RP9 it will be great. Factory certified +P (rare), 15r mags, lifetime warranty. Already have the rp9 and love it. This one should handle the +P and the 450 SMC (wow) without worry, whereas my $600 Glock will not. The reviews were good and the price was even better! All reviews on the web seemed to be very positive. Best Price found! Same reason for buying S&W 627 Pro! How many mags with this one? BEST ANSWER: 2x15 round mags. It's hard to get 15 in there. I keep 14 in the mags and one in the chamber. Plenty rounds even for multiple intruders. My RP 45 came with two magazines. Nice firearm, especially at this price. As you will read in other reviews, the 15th round is near impossible to load. Was really pleased with the transaction. Gun ordered Tuesday afternoon and my FFL received it Wednesday. I love it, the fit is perfect, it's very smoothe. Great working gun for the money! Appears to be well constructed. Believe to be a good pistol at a bargain price. I have not shot this pistol yet- just haven't had time. Disappointed to hear Remington had to file for bankruptcy. Wonder about customer support if needed. About 300 rounds and no issues. I carry this pistol in my work truck every day. Its less than half the price of my FNX 45 , and with the same round count of .45 goodness.i like the way it fits my hand, and the recoil is light for a .45. My biggest positive is the price, if it gets lost or stolen, I’m not out the same as my FNX. Best deal in .45 available today. Shoots very nice. Little to no recoil. But it is very large fun would not make a very good conceal and carry. So far 350 flawless rounds through the gun. 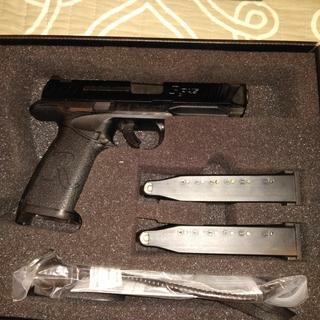 My duty gun is S&W M&P 45 DAO. Remington is little heavier and little rougher around the edges than my S&W, but single action trigger makes up for it once you get used to the "toy gun trigger feel" described by other reviewers. My shooting is more accurate with the Remington than with the M&P. I keep it in the home safe and I like 15 round magazine capacity which should be enough even for multiple intruders. Very easy to shoot. Barrel Length Range: 4.00" to 4.99"